This article first appeared in The Edge Malaysia Weekly, on September 3, 2018 - September 09, 2018. JUST when investor confidence is returning to the oil and gas industry, given that crude oil prices have managed to stay above US$60 per barrel so far this year, domestic oil and gas companies are sending shock waves through the market one after another. The latest is Bumi Armada Bhd, one of the few local oil and gas giants on analysts’ recommendation lists. The group, which is controlled by business tycoon T Ananda Krishnan, last week disappointed its shareholders by announcing a massive impairment of US$119 million (RM478.9 million) arising from its floating production storage and offloading (FPSO) vessel Armada Kraken. This comes when investment analysts and investors were convinced that the worst was over for the company. The stock fell off the cliff last Tuesday, crashing 21.6% to a 21-month low of 52.5 sen. Its gains since the beginning of the year were wiped out in a single trading day. “This is very bad ... there wasn’t any guidance or hint from management. It was a real surprise to the market. That explains the knee-jerk reaction to dump the shares,” says an analyst who tracks the counter. The root cause of the problem is Armada Kraken, which Bumi Armada’s unit, Armada Kraken Pte Ltd (AKP), was supposed to charter to EnQuest Heather Ltd, EnQuest ENS Ltd and Nautical Petroleum Ltd. It is understood that the three companies declined to accept the FPSO because certain requirements stated in the contract were not met. As a result, AKP has to pay penalties over the duration of the firm charter period — a 25-year contract that covers eight years (between June 2017 and June 2025) plus 17 annual options until June 2042. Last week, Bumi Armada announced that it had signed an amended agreement (AA2) with the three clients, which should end the impasse over Armada Kraken’s failure to meet full specifications. Subsequently, the group decided to book an impairment of US$119 million. “An impairment assessment has been carried out by the company based on the terms in AA2. 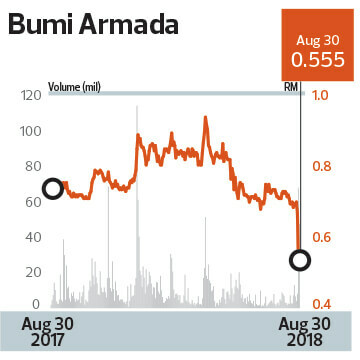 As a result, the company recognised an impairment expense of US$119 million (about RM477 million) in the financial statements,” says Bumi Armada in its announcement to Bursa Malaysia. The large sum dragged Bumi Armada into a net loss of RM585.48 million in its second financial quarter ended June 30, compared with a net profit of RM116.59 million in the previous corresponding period. Quarterly revenue was also lower at RM654.04 million versus RM694.4 million a year ago. The group was also in the red in its first six months ended June 30, with a net loss of RM537.06 million compared with a net profit of RM164.69 million previously. Analysts concur that the quarterly earnings were disappointing even with the exclusion of exceptional items. “After stripping off the impairment and other exceptional items totalling RM626 million, the group’s core net profit stood at RM128.7 million (down 31.5% year on year), coming in below our and consensus expectation at only 24.4% and 29.2% of full-year estimates respectively,” writes PublicInvest analyst Nurzulaikha Azali in a results review last Thursday. Nevertheless, the selling pressure eased a day after the share price plunge. At below 60 sen, the stock has become attractive again, with some noting that the amendment agreement would soon dissipate the cloud of uncertainty hanging over Armada Kraken. “While appearing negative on the surface, this short-term pain will bear fruit with a quicker final acceptance, in our view,” says Affin Hwang Capital analyst Tan Jianyuan in a research note. Furthermore, Bumi Armada’s outstanding order book remains healthy at RM20.2 billion with additional optional extensions of up to RM11.8 billion, according to PublicInvest. “We also understand that the group has a robust tender book in hand for projects in West Africa, Brazil and India, with a target to secure one FPSO contract per year,” says Nurzulaikha. As the kitchen-sinking has ended, “the risks are to the upside, particularly after the sell-off on Thursday”, says CGS-CIMB. However, the research house reminds its clients that Bumi Armada has bank borrowings of US$500 million, which are due in three roughly equal tranches in October and December this year, and in May next year. “Bumi Armada is now looking to refinance these before October as some banks do not want to roll over the loans, and it only has RM1.4 billion cash. The key downside risk is if Bumi Armada fails to secure adequate refinancing or on unfavourable terms,” says CGS-CIMB. It is worth noting that the group has downside protection in the form of a euro medium-term note facility of up to US$1.5 billion, which it can tap, although rates will not be good until Armada Kraken crosses the final acceptance threshold. The question now is whether Bumi Armada will follow in its peers’ footsteps and explore a recapitalisation.